On May 13, 1939, 937 Jewish refugees boarded the St. Louis in hopes of escaping the persecution of the Nazis. Captain Gustav Schroder happily filled his ship in efforts to deliver these Jews to safety and freedom. A non-Jewish German, he showered his guests with feasts, entertainment, and luxuries they had been denied from Hitler simply because of their faith. For the first time in years, these Jewish travelers were treated with respect and dignity. That is, until they reached Cuba. Unbeknownst to the refugees, Cuba had recently retroactively revoked the visas of most of these passengers. Captain Schroder had left Hamburg with his passengers anyway, determined to rescue these souls from Hitler's death grip. Captain Schroder worked tirelessly for a week trying to convince Cuba to accept the refugees they had agreed to just a few weeks earlier. Only 29 were able to actually disembark in Cuba. Twenty-two Jewish passengers had valid U.S. visas and were allowed off the ship along with four Spanish citizens and two Cuban nationals. One passenger was so distraught over the thought of returning to Hitler’s Germany that he attempted suicide. He was taken to a hospital in Havana for his injuries. Once Captain Schroder accepted that Cuba was not an option any more, he pleaded with President Franklin D. Roosevelt for help. He headed towards the Florida coast as he tried to negotiate with the United States. As Roosevelt remained silent, the St. Louis was closely watched by the Coast Guard so as not to run ashore, forcing America to accept the refugees. The United States denied Schroder's appeals for assistance, claiming our quota for German immigrants was full. Schroder then looked to Canada but was again rejected. No one wanted the ship full of German Jewish immigrants. Schroder had no choice but to turn his ship around and head back to Europe. He was not done fighting though, as he demanded asylum for his refugees before returning his ship to Germany. The U.S. was willing to work with several European countries in finding protection for the Jewish immigrants. 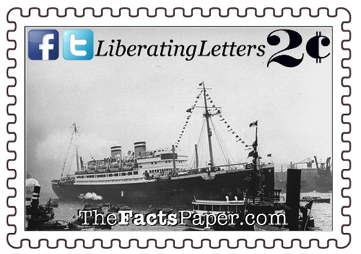 Once arrangements were agreed upon, Captain Schroder docked his boat on June 17, 1939, at Antwerp, Belgium, with 907 passengers. Two hundred eighty-eight passengers were sent to the United Kingdom while France accepted 224, Belgium received 214, and the Netherlands welcomed 181. The sanctuary for those in Belgium and France was short-lived as Hitler invaded them in May of 1940, putting those refugees back into the direct danger they were desperately trying to escape. According to a study conducted by the United States Holocaust Memorial Museum, of the 908 people who returned to Europe, approximately 254 were victims of the Holocaust. Most were executed at Auschwitz and Sobibor, while others died in interment camps or attempting to escape the Nazis. Liberty, while progressive liberals want to argue President Barack Obama is a more enlightened president for accepting Syrian refugees, they are completely misguided in their analogy. As Roosevelt rejected the Jewish refugees persecuted by the Nazis, Obama continues to reject Christian refugees persecuted by ISIS. (see Holocaust: Then and Now). Nazis would not have pretended to be Jewish just like ISIS members would not pretend to be Christian. But since the Syrian refugees are Muslim, ISIS fighters blend right in. Add that to the fact that the vast majority of Syrian refugees are twenty-something males, and you have a textbook red flag for national security. Roosevelt saw a threat where there was none, and Obama purposely rejects the threat staring him in the face. As Schroder helped the passengers of the St. Louis find homes in Europe, the U.S. should be doing the same with the Syrians in neighboring Muslim countries. Instead, Obama is actively and aggressively bringing them here. The Christian Holocaust being conducted by ISIS, however, Obama sees as “Christian wailing” and “sob stuff”. Liberty, we have not learned from the past. In fact, we have allowed the truth to be so distorted we are eagerly repeating our mistakes. God is a just God and in efforts to gather His children back to Him, He will discipline when needed. I fear we are about to be grounded for our arrogance and disobedience to our Heavenly Father. We must pray for our fellow man and preach the Gospel more than ever as the harvest is ripe. As the world goes dark, Liberty, you must shine the light of Jesus Christ for all to see. There is hope and it is God. May He bless us still.